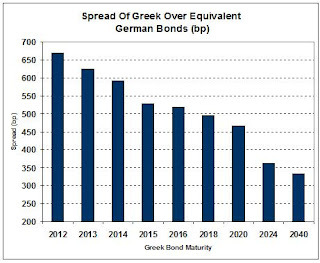 I will hazard a prediction: The most likely resolution of the Greek debt crisis is a combination of debt restructuring (haircut plus maturity extensions) and IMF/EU funding for the next 2-3 years. Before I get accused of becoming a prophet in my old-blog age, I hasten to clarify that this is what the market is already predicting: the 4.60% Greek Government Bond due 9/2040 is currently trading at 68-69 (YTM = 7.20%), i.e. at something less than 70 cents on the dollar. This is a spread over the nearest equivalent German bonds of 334 basis points. By contrast, the shorter 6.25% GGB due 2020 is trading at 89-90 (YTM=7.75%), a spread of 467 bp over Bunds. Notes coming due in two to seven years are trading at even wider spreads - see the chart below. I expect, therefore, a voluntary debt swap i.e. swapping bonds coming due over then next 5-10 years for longer maturities, maybe with a self-amortization feature, along with the IMF/EU funding package. The voluntary feature will likely be there to avoid triggering a credit event under CDS terms, but if structured properly most everyone would want or have to participate - a.k.a. a shotgun marriage. Concurrently, the Greek government could enact more revenue-enhancement measures (that's what new taxes are called, in beffuddle-the-masses speak), probably a real estate ownership tax. Such a tax could easily raise 5 billion euro/year (current debt service runs at 12-13 billion/yr) and, crucially in a country where tax avoidance is the national sport, would be nearly impossible to avoid. Take that tax money, segragate it into a special account administered by a Paris Club-type of group, earmark it for the sole benefit of those accepting the debt swap with first-lien bonds and voila.. The key element in such a deal will be to structure it in such a way as to minimize immediate stress in the balance sheets of major Greek debt holders, i.e. foreign and domestic banks, plus pension funds. Given the generously stretchy accounting rules for banks holding sovereign debt, it shouldn't be too difficult. P.S. I looked at the numbers before I came up with the "..most likely" part of the post's title. Playing around with the Cumulative Probability of Default (CPD) formula, we can evaluate various scenaria of recovery rates (i.e. how much the "haircut" will be in a potential debt restructuring). If we assume a generous 80% recovery (20% haircut) current CDS prices of 500 bp indicate a CPD around 60%. And, in fact, most Greek government bonds already trade around 70-85 cents on the dollar, depending on maturity and coupon. I don't think Greece will bother to go through a painful debt restructuring process unless it can significantly reduce its debt load, say at least down to 80% of GDP from a projected 120% at the end of 2010. This implies a haircut of approx. 33% (recovery of 67%). Plugging in these numbers to the CPD formula (r=67%, CDS=500) we get a 5-year cumulative probability of default of 55%. UPDATE: Five year CDS now trading around 650 bp, implying a CPD of 62% at 67% recovery. I wonder if excessive (and hidden) leverage of creditors (remember that EU banks are much more opaque than your Gringo banks) might not be too much to hide if they suffer a haircut or a liquidity crunch (ie, only being paid in the long future when they are expecting their money now). Using Helicopters and printing presses is against the local religion (I don't really know if I agree or not, I am just noticing) - at least the religion professed in Berlin or Frankfurt. She seems to be dealing a few well placed blows to our collective hubris these days. Hell, I just read the following and as I'm sure you'll see it reminded me of some of your earlier posts so I thought I'd pass it on for fun. "After a while, the customer gives up shaking his head. "Oh well, I guess he never made it to this dinner", he says as he heads to the bar for one more drink." And the customer is indeed right, believe it or not. The sucker of this game - US taxpayer - did not make it to the dinner. I just can't wrap my head around this international game of "Let's All Pretend We're Actually Going To Pay Our Debts Back". It just seems that there has to be a tipping point. Is my imagination too limited? Could the game go on for another 50 years? Problem is the compounding spiral is tightening NOW and the bailout that would have bought time is about ... six months or so too late. The bailout that would have given Greece the time to restructure itself, wipe out the egregious bad faith loans and allowed for duration to be extended. Oh, well ... was a nice idea. I will say it again.. you cannot solve insolvency (too much debt vs. income) by incurring more debt. 5 billion is a hell lot of money. Around 1.5% of GDP. It will essentially depress consumption further, and thus other taxes like VAT. Re: RE tax depressing the economy. Greece pays approx. 5% of GDP for interest on govt. debt. Because bondholders are almost entirely foreign (70-80%) this money is not recycled back into the domestic economy. Cut that bill by 30-50% (the haircut in the debt restructuring) and it saves approx. 4-6 billion euro/yr. Replace this with the RE tax and net-net you're even. And, of course, the tax may be amended later on as the need to service the debt goes down. Hellasious many thanks for this post. It seems that the rumours of a Greek restructuring - voluntary or not - are getting louder and louder. Many thanks for your thought-provoking blog. Re: "Replace this with the RE tax and net-net you're even." This comment is a little like this. Remember we live in a fractal world and your analysis washes over the issue of aspect inherent to the problem itself. So it may be an absolutely accurate observation from your vantage on the 35th floor of the building, but you are also saying that since the guy on the 17th floor screwed up, the guy in the 10th needs to pay up. All this is likely to go is make an ally of the guy on the 17th while the guy on the 10th floor will be upset with both the guy in the 17th floor AND you on the 34th. I really love your post, i also have blog related to Debt Settlement, you may visit:-http://debt-settlement-resource.blogspot.com/ for more details. Since the strikes are shutting down hospitals, it will be interesting thing to look at Greek population health and mortality data in a few years. I'm willing to go on record as also making a prediction: I suspect Greece will experience a temporary improvements in both health and mortality and sadly this will fall back to trend after the crisis passes. ... Not that this was ever a very important issue in this issue. Your argument that paying a 5B tax would substitute the outflow from interest payments (abroad) would be interesting except that Greece almost never paid its interest bill from savings: it borrowed the interest as well. In other words, it doesn't run a primary surplus and did so (supposedly) only for a few years during the late 1990's. 100 year bonds at 1% backed by IMF? Any takers? Any pact that introduces priority in the debt is going to be a killer for future issuance. 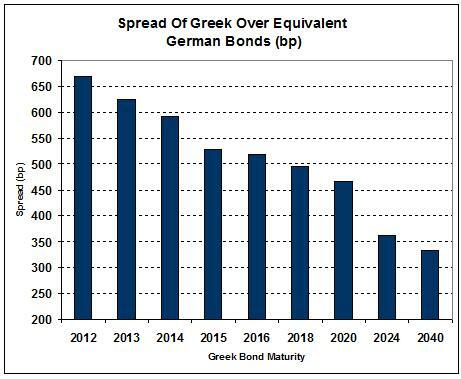 Greece would have to restructure sufficiently to be out of the market for a few years. I found your website and as we both are in the similar field I would like to exchange links with your site.